Over the New Year we promoted our commitment to third party developers (3PDs), where we hinted at creating a cool hangout for all 3PDs to learn, exchange, mentor and explore their creative ideas. Well, today, as promised, we're delivering our Developer Network Portal. 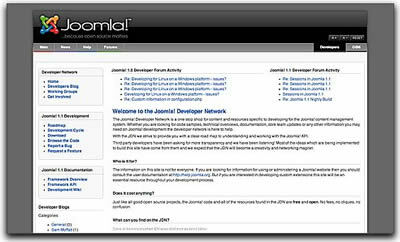 The Joomla!™ Developer Network Portal, is, we believe, a first in the Open Source world. "This idea has been driven by both core development members and third party developers," said Joomla! project leader Andrew Eddie. "It represents another milestone in the maturity of Joomla! and there is no doubt from the feedback we're receiving it's a benchmark worth having." Joomla! lead developer Johan Jansens said he wanted to see the portal become the "hangout" for developers to support each other and be free to explore the full power of Joomla! and its many innovations. "This is particularly true of Joomla! 1.1. We've already been working with 3PDs to help them make their components work well and draw from the power of the new API." Joomla! 1.0.7 [ Sunburst ] is now available as of Sunday 15th January 2006 21:00 UTC for download here. 1.0.7 is essentially 1.0.6 repackaged to fix one major bug in 1.0.6 - therefore it should still be considered a Security Release. It contains nine (9) `Low Level` Security Fixes, and seventy (70 plus minor/non-critical bug fixes. We recommend that you upgrade to this version. If you are running 1.0.6 you MUST upgrade to 1.0.7. 1.0.7 is available as a Full Package, which contains all Joomla! files and a Patch Package which contains only the files that have been changed by the Security & Bug Fix work conducted. To ensure the integrity of the files you are downloading you are advised only to download from the 'Official Source' on the Official Joomla! Forge. As an extra security measure we now make available the MD5 checksum of the respective package files to allow people to do integrity checking. Read more: Joomla! 1.0.7 released! Well folks, we've had this under wraps somewhat but what better time to share some good news than at New Year. The concrete is setting on our Joomla!™ 1.1 codeset and it will be delivering many cool features, primarily designed to provide Third Party Developers (3PDs) with more power and ease of code integration. Yes, it's true. Joomla! 1.1 will provide an entry into a modern codeset allowing Object Orientated development, with inbuilt internationalisation (multi-lingual support), a refactored core and, FTP extension installation. Put simply, core restructuring and modernisation of code all built on a robust framework which allows the developer more power and flexibility with less effort. With a New Year around the corner, the Joomla!™ Team would like to wish the community the best. Thanks to those of you who've taken the time to write with your wishes for the year end. Our happy worker bees have been continuing development during the Festive Season and released 1.0.5 in time for Christmas. We've got some more good news coming in the New Year. In fact, we've already hinted a couple of times about raising the bar in terms of power and standards for third party developers. We've also got some news about a forthcoming release with both feature and functionality improvements. 2006 will see us build on new technologies enhanced by a more robust, standardised, modern codeset. What are we saying here? Well I guess you'll need to wait to see the announcement on January 1st! 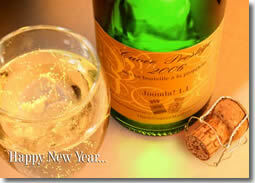 Until then, enjoy your New Year celebrations and if you're not partying too hard drop by for a Joomla!™ Powered 2006. Double Dutch Treat for Joomla! Two Dutch mainstream information technology magazines have delivered Christmas/New Year treats for current and future Joomla!™ users. CHIP magazine's article focuses on Windows environment information technology and emerging trends, and features Joomla!™ in it's latest edition, as does PC Active magazine. The CHIP article takes readers through a step-by-step tutorial about how to set up a website locally on their PC, using Joomla!™. The solution they've recommended is WAMP (from Wampserver), delivering a solid local server environment for the user to try Joomla!™ on their PC without needing a dedicated web host. The PC Active article backgrounds the developers and community splitting from Mambo, and notes that the Joomla!™ forums are vibrant and active and our teams are working hard to make the whole CMS/Framework more easy to use by Third Party Developers (3PDs). Read more: Double Dutch Treat for Joomla!